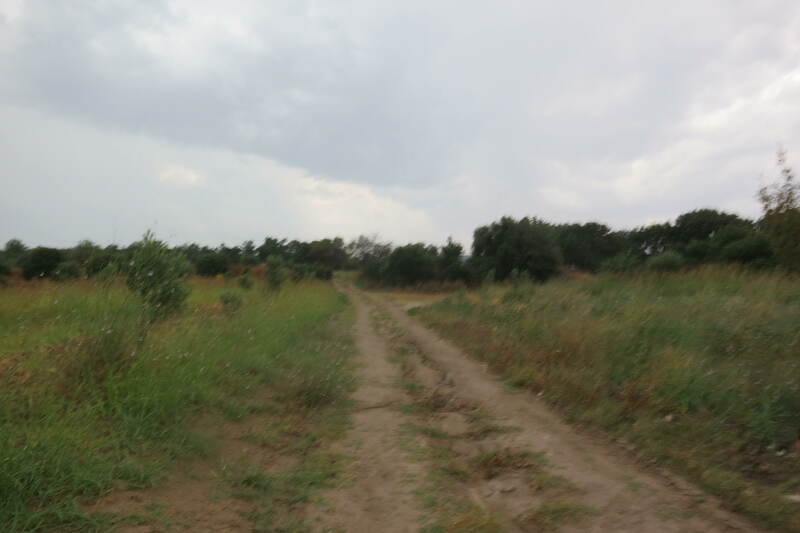 The road narrows, definitely not suitable for tourist buses, traditional Turkish music plays on the radio. Wow, lightening strikes a tree right beside us with a sharp crack, guide whistles! We stop in small village, more tea. 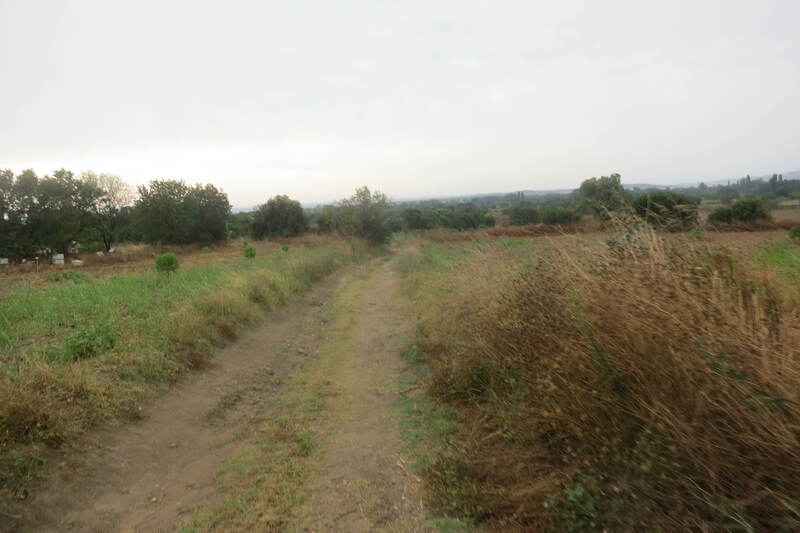 The road deteriorates, more mud, flooded verges, more farm vehicles, tractors with trailers full of melons and cucumbers. Huge fork lightening flashes across the hills, the rain is lessening (optimism.) we turn off the road onto a track, driver nervous, passenger worried about pushing car. We park, well abandon, car in the gateway to a field and start walking up the track where the first thing that strikes me is the mud. Cloying would be the word, instantly my shoes doubled, tripled in weight and soon they were unrecognizable. Trousers too, splattered up to the knees. Up and up until we came to the Memorial. If it had been sunny I would have said it was shaded but in the middle of a thunderstorm it was just, calm. I found the Memorial to Great Uncle Seph’. It was very emotional and moving. 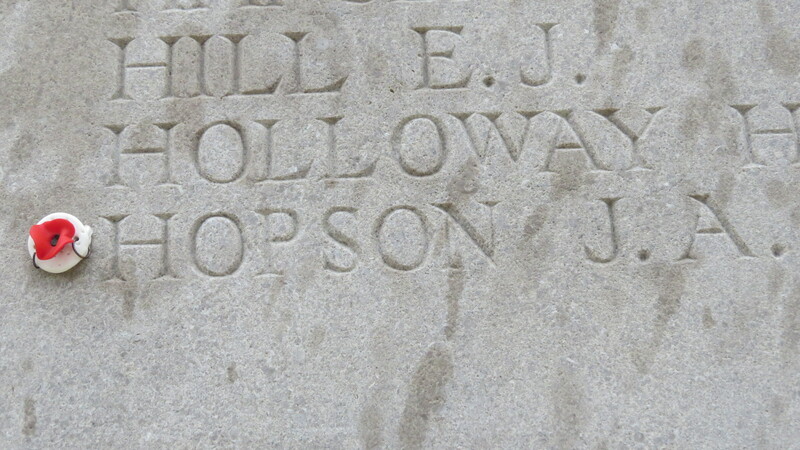 Here was his name on a huge, towering, marble slab, remembered from ninety nine years after he was killed, literally in the middle of nowhere. Despite the rough track up the hill the grounds were clearly regularly maintained, grass mown, flowers cultivated and healthy looking. Why was he here in the first place? Born in a prosperous market town in Southern England it seems he had some sort of “falling out” with the family and left Newbury for New Zealand. That, surely, was a major undertaking at the beginning of the Twentieth Century, no jumping on a 747 and arrive within hours. How did he get there? Where did he live? Did he work at all? Will we ever know?All I know is that my Mum’ s Granny never recovered from the loss and Great Granny Jo died an unhappy woman. It was time to leave, we were both getting soaked, and walked back down the track accompanied by the banging and booming thunder. It was quite apocalyptic. Was I getting a message? Maybe, maybe not but I like to think so as I believe I am the first and only family member to make it to the Memorial on Hill 60. Ignoring the weather the guide said we should go to the interpretive center. Ok, says I, not really knowing what it was. 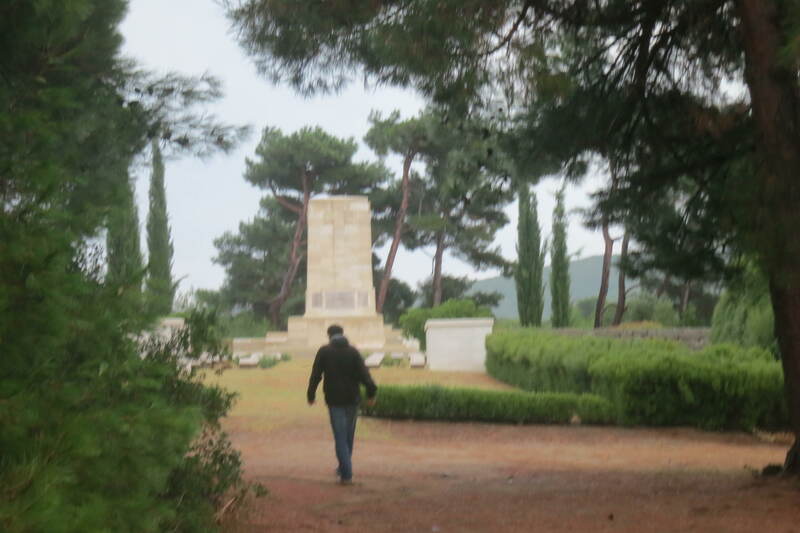 Turned out to be a vast building built to enhance the tourist business by showing short movies about the Gallipoli Campaign in ten different rooms, with special effects. During the movie of the Allied Naval bombardment of the gun emplacements on the Dardanelles shore for instance, the floor vibrated. That kind of thing. A sort of Disney Gallipoli. It got worse. Stirring music and images of the Prime Minister, Erdogan, with President Obama, another with the Queen, claiming Turkey’s new place in the World order. I will say no more. Then it was time for lunch and a trip to Troy, you know, the Illiad, Helen, Paris, Menelaus, Hector, Achilles and of course, the horse. But that will have to wait for another day as I am now on my way back to Istanbul. 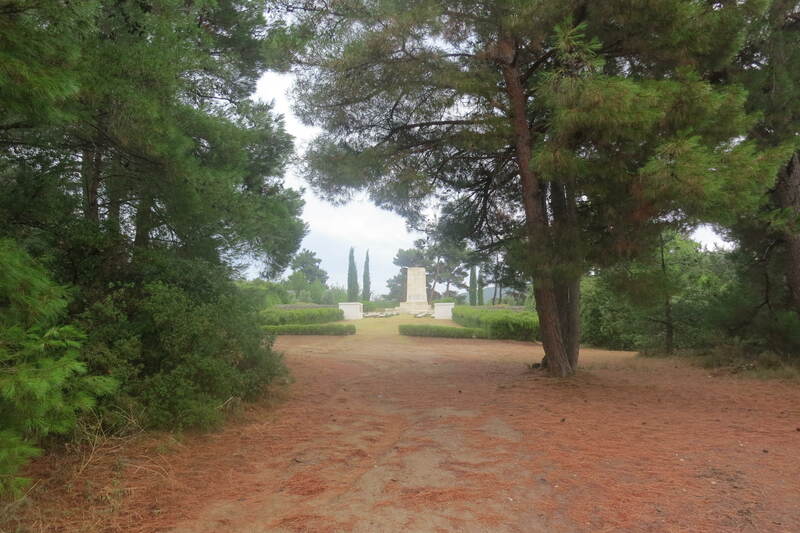 The track up to the Hill 60 Memorial. Great Uncle Joseph Hopson. I added my own tiny poppy. 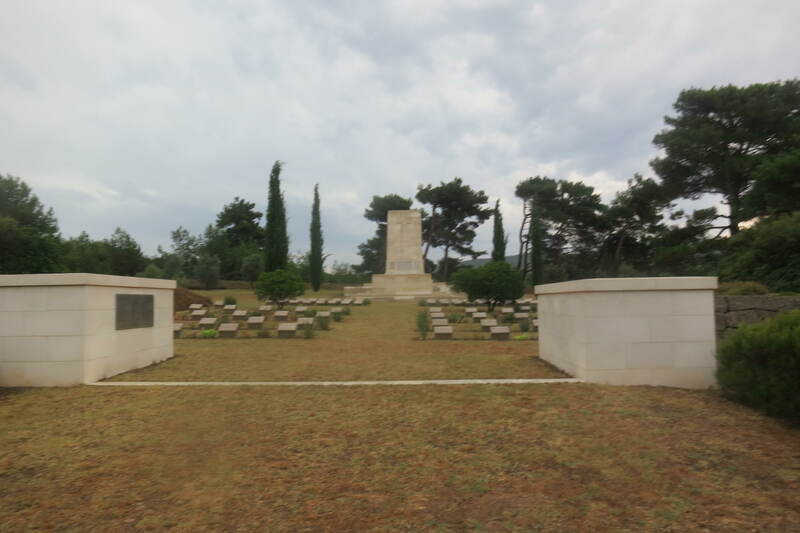 A view of the Hill 60 Memorial. More mud on the track. small tear I hasten to add. Well done indeed!! Not really awful Mother, just a bit challenging shall we say. My shoes still look like I just came in from the fields. Sorry about the small tear. Dear Tim, you never mentioned this before so I am, of course, deeply touched. Would you like me to do some research on your uncle, as in census records, to see if I can find anything on him during his time in NZ? Well sure, that would be great, thanks. I might prefer any info you find to come to me via a PM on f/b tho! Thanks again and happy hunting. OK, will go into my genealogy sites and see what turns up. Do you know which port he left out of to sail to NZ? No, no idea, but as Southampton is just down the road from Newbury (Berkshire) I could hazard a guess, maybe. But then again, wasn’t Liverpool a more important port back then? Or even the Port of London? Well done Dad! Truly amazing that you made it all the way there and very moving. But most of all, sad. I agree…very moving….! I also could feel the bumps in the road on the way up…thanks to the “live” blog. Amazing experience! I learned about this part of history along way as well. Nice work,Tim, hope you’re feeling ok after all that! Yes Anna, it was a very long day and has taken a while to recover. Maybe a “live” blog from the back of a camel is in our future! So moving, Tim, and wonderful you got to see this part of your family history. It seems fitting that the weather was not dissimilar to the conditions under which so many young men fought and died, although pretty tough on you. Your blogs are amazing. Well thanks Annie. Will try to keep it interesting. Turkey’s weather being a bit British at the moment, ie changeable. Had to borrow a brolly this morning to go for breakfast.